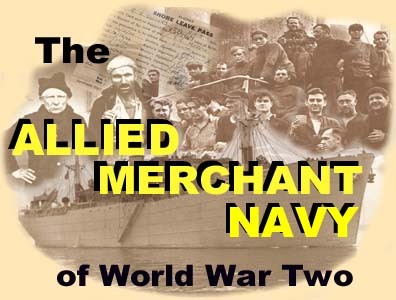 Welcome to our website which is a collection of pages dedicated to those who served in the Allied Merchant Navy during World War Two. All of us who have contributed to this site hope that you will find our topics interesting and educational as well a lasting tribute to the Merchant Navy and all the others who aided them in their vital role. The world today can never repay the debt owed to these men and women. To them we say "Thank you -- we will never forget what you did." Regretfully, our former Message Board and Guestbook have been discontinued, but please see our various links pages for other websites with specific information on merchant seamen and ships. Billy McGee of the former British Merchant Navy at War 1939-1945 website has been very involved over the years to ensure that the contribution of Merchant Seamen will always be remembered. A few of the causes Billy has taken part in are fund-raising for memorial plaques at the Bidadari Gardens, Singapore and the Milag Nord Prisoner of War site in Germany. Billy also joined in the campaign of Canadian Merchant Navy Veterans to have September 3rd designated as Merchant Navy Veterans Day in Canada. 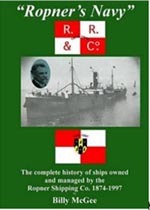 Following the success of Billy McGee's efforts to raise money for the Merchant Navy Memorial in beautiful Ropner Park, Stockton-on-Tees, England, Billy wrote his splendid book, Ropner's Navy, honouring the men who served aboard the Ropner ships. For availability, please check Amazon.co.uk. Stockton-on-Tees's Gazette Live has some very interesting articles about Billy McGee beginning with Andrew Pain's 2005 article "Billy ...and His Heroes". To read that article and Gazette Live's other interesting articles about Billy McGee, go to the main page of Gazette Live and search "Ropner's Navy" . BILLY'S CANADIAN CASUALTY LIST OF WWII MERCHANT SEAMEN Billy McGee has compiled a list of the Canadian Merchant Mariners lost from Canadian, British and foreign ships in WWII. Billy has also included British Seamen lost on Canadian owned/managed ships. To view Billy's list Please Click Here. To return to this page from the Casualty List, just click on your browser's "Back Button". Billy McGee joined in the campaign led by author Gabe Thomas to raise money for the Merchant Navy Prisoner of War Memorial at the site of the WWII PoW camp Milag Nord, near Hamburg, Germany. "The three Milag Memorial Plaques were unveiled in Germany on the 28th April. Have attached photos of them before they were shipped over. The unveiling was attended by 20 ex Milag PoW's and 30 local Germans as well as the Author of Milag: Captives of the Kriegsmarine Gabe Thomas, who first came up with the idea. Cannot upload photos to my site, so please pass on to any interested parties." Gabe Thomas, President of the Merchant Navy Prisoner of War Association, also created the MILAG PoW website which has a wealth of information about the Milag camp as well as the neighbouring Marlag Camp which housed Royal Navy seamen. Be sure to read Milag Nord's Milag Link to Olympics, the story of Percy Coe, Lord Sebastian Coe's father and one of the few survivors of the sinking of A.D. Huff. Canadian Merchant Navy Veteran Jack Stapleton, and his wife Wanita of Wasaga Beach, Ontario, worked tirelessly with many others on the campaign to have September 3rd designated as Merchant Navy Veterans Day in Canada. After the bill was finally passed into law on June 19, 2003, Jack and Wanita hosted the first of their annual Merchant Navy Veterans Day Reunions. At this historic First Annual Reunion in 2003 a group photo was taken and kindly sent to us by one of the reunion guests -- Merchant Navy Veteran Martin "Bud" Walsh. This splendid photo can be viewed by clicking here. Jack Stapleton was awarded the Queen Elizabeth Diamond Jubilee Medal in 2012. Sadly, he passed away in November 2013. The "Simcoe News" wrote a very moving obituary entitled Jack Stapleton: So Long Sailor. To read this touching tribute please click here. Canadian Merchant Navy Veteran Martin "Bud" Walsh is also a recipient of the of the Queen Elizabeth Diamond Jubilee Medal. To read the article about Bud written by Maryanne Firth of the St. Catharines Standard, please visit the Welland Tribune. For more information about Bud's wartime experiences and information on his memoir, The Polish Experience please visit our Table of Contents page. The Veterans Affairs Canada website has a wide variety of information of interest to Veterans and their families. As well as the Canadian Virtual War Memorial data base, there is also the Merchant Navy War Dead Registry which can be searched either by the person's name or the ship's name. The website also features videos and historical booklets such as Valour at Sea: Canada's Merchant Navy by Patricia Giesler. Singapore, Tuesday 17th May 2005 A memorial plaque dedicated in memory of British merchant seamen and merchant seamen of all nations, civilians and others buried at the former Bidadari cemetery was unveiled this morning by Commander B. Boxall-Hunt RN OBE representing the UK High Commissioner and Reverend Mervyn Moore, an ex-seafarer; Port Chaplain of the Mission to Seafarers. The unveiling and dedication ceremony of this memorial plaque took place at the Bidadari Garden, located off Mt Vernon Road. The Bidadari Cemetery is one of Singapore’s well-known landmarks dating back to 1907 and was closed for burial in 1972. Amongst those who were buried at the Bidadari Cemetery, many were Merchant Seamen of many nations from old shipping companies like Blue Funnel, Glen Lines, Straits Steamship, Royal Dutch Interocean, CP Ships and British India, etc that traded through Singapore. Ex- Servicemen, Federation of Malaya Police who were killed during service and many others who perished in the Changi internment camps during World War two were also buried at the Bidadari Cemetery. It is thanks to the efforts of a stalwart group of ex-Merchant Navy Officers who contacted the National Heritage Board, Singapore that this dedication ceremony was organised. It was mutually agreed for a plaque to be placed to show respect to those who had lain within the Bidadari Cemetery by the Merchant Navy and the National Heritage Board, Singapore. The stalwart group successfully raised sufficient funds through donations, contributed from people all over the world. The donated funds were used for the plaque’s manufacture in Australia, shipment to Singapore and plaque installation. The National Heritage Board, Singapore gave much valuable assistance to the stalwart group in their efforts to bring the memorial plaque to Singapore and to erect it at the Bidadari Garden. The unveiling and dedication of the plaque is a reminder to us all, of those who gave so much for the many. The plaque stands to remember them for all eternity." When he was a young man John Bax took his sea training at the famed Outward Bound Sea School in Aberdovey (Aberdyfi), Wales, before beginning his career with the Alfred Holt (Blue Funnel) Line and the Straits Steamship Company. After he retired from the sea Captain Bax became very active on many things concerning the Merchant Navy. From his home in Ontario, Canada, he generously shared his vast knowledge of ships with others around the world. As well as becoming involved with issues such as the Bidadari Memorial Plaque, Captain Bax also campaigned tirelessly for September 3rd in Canada to be designated as Merchant Navy Veterans Day. The campaign was an arduous one, but Captain Bax was determined to succeed -- he always signed his emails with the caption "We NEVER give up!" Captain Bax was also one of the Moderators on the splendid Merchant Navy Officers website, created by Fred Waddington. Sadly, both Captain Bax and Fred Waddington passed away in 2014 and the Merchant Navy Officers website was taken down. But, their legacy lives on in the many projects they undertook to ensure that the service and sacrifices of Merchant Navy seamen will always be remembered. To read about Marion Kelch and the Artifacts Committee's successful campaign to save the Empress of Ireland Artifacts please see the Star News article Empress of Ireland Artifacts Saved. The CMNVA's Official Newsletter is "The Red Duster". To send a submission to the "Red Duster", please contact Velma Emberly at the above email address. November 7th, 2000: The British government announced that Merchant Seamen and other British groups who were imprisoned by the Japanese in WWII (Far Eastern Prisoners of War or FEPOW) will now receive compensation. For more information please go to the Veterans UK. The Burma Star Association website also has information of interest to Far Eastern Prisoners of War (FEPOW). To go to our TABLE OF CONTENTS Please Click Here or on the image at the right. We have several Links Pages -- a General Links Page, a CPR Ships Links Page and Chuck Betsworth's Maritime links Page. Please see the Table of Contents for more information. To return to this page at any time please click on the INDEX PAGE link located at the top and bottom of each page. I regret that due to lack of time, I'm no longer able to reply to e-mail queries.